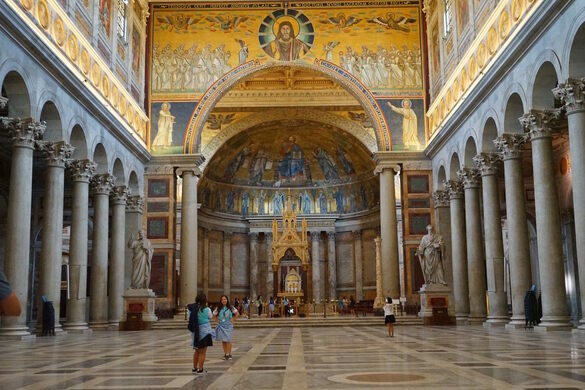 Built in the 4th century, this massive Roman church has undergone centuries of change and expansion, and along the way has become home to a series of pope pictures that are said to herald the end of the world should they be completed. 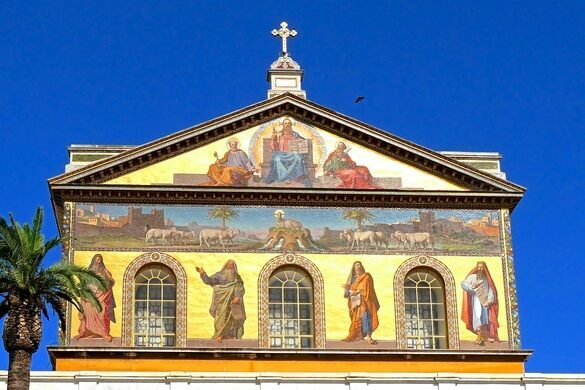 Along with the Archbasilica of St. John Lateran, St. Peter’s Basilica, and the Basilica di Santa Maria Maggiore, St. Paul’s Outside the Walls is one of the four highest ranking churches in the Catholic hierarchy. It was originally erected by Roman Emperor Constantine I, supposedly over the grave of Saint Paul himself. The basilica itself managed to retain its original primitive if ornate architectural design for centuries after its construction. Unfortunately a devastating fire swept through the ancient church nearly destroying the entire site. However the site was quickly refurbished thanks to multinational donations of building supplies such as alabaster and lapis, which allowed for many of the original ornamentations, both architectural and otherwise to be recreated in a close approximation of the original. One of the features which was restored after the fire was a row of papal friezes that took up a single row above the 80 columns in the main hall. A commissioned artist reproduced almost all of the popes that once filled the medallions, making up the visages of some whose portraits were lost. However, since there is just the single row of medallions ringing the church interior and thus a finite number of spaces. With a new portrait being added with each new pope, its getting pretty tight and there are only six spaces left, which according to some may portend the end times. According to a local legend the pope whose face graces that last space in the row will in fact be the final pope as the Second Coming begins. While this is simply apocryphal and not condoned by the Catholic church, we only have a handful of pope’s lifetimes to find out who we should have believed.